UDM Downloads > Any DVD Converter for iPod! Any DVD Converter for iPod is an All-in-One DVD ripper and video converter which helps you rip DVD and convert various video formats including MP4, AVI, RM, RMVB, QT, MOV, 3GP, 3G2, FLV, MPEG-1, MPEG-2, DVR-MS, VOB, MKV, ASF, DivX, OGM to MPEG4 movies or MP3/AAC audio files which are playable on Apple iPod, Apple iPhone and Apple TV. AVI, WMV, 3GP, 3G2, FLV, MPG, SWF, OGG, WMA, WAVE output formats are also available. Any DVD Converter for iPod downloads online videos from YouTube, Google Video, Nicovideo and convert them to MPEG-4 movie for APple iPod, iPhone and Apple TV only in one step by pasting the URL. Any DVD Converter for iPod can also burn various video files to DVD with customizable DVD menu and you can enjoy all videos on home DVD player easily. Both NTSC and PAL are provided and you can select one according to your TV system. Any DVD Converter for iPod is the best DVD Ripper and video converter for your iPod, iPhone, Apple TV with fast converting speed and excellent video quality. Any DVD Converter for iPod provides lots of useful functions. It supports batch conversion, it can merge several video clips in different formats into one file, manage output video files by group or profile, set process prority and speify number of threads to use for encoding. Most of the parameters for output profile are customizable, you can easily select or enter video size, video bitrate, video framerate, audio bitrate, sample rate and set audio channel. Trimming is also available so that you can easily specify any part of the video to convert. As to DVD ripping, you can select any titles or chapters or time section to convert, specify audio language, subtitle and view angel. 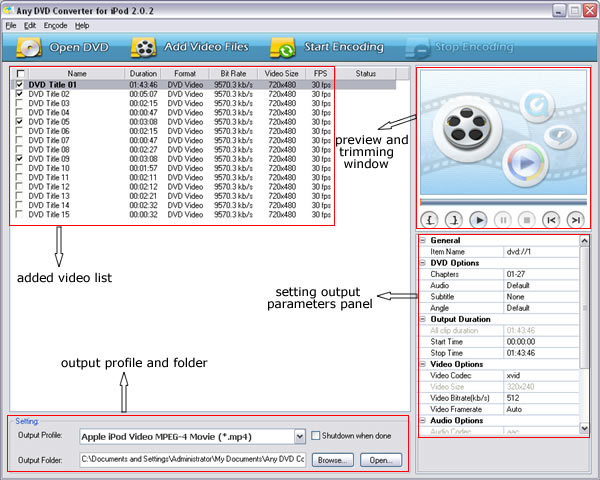 DVD folder copied from DVD video disc can be also converted the same as DVD ripping. With Any DVD Converter for iPod, you can easily enjoy any video, DVD and YouTube video on your iPod, iPhone or Apple TV.